For those that came in late, well, you're really hurting my feelings. Seriously, I could use the validation. 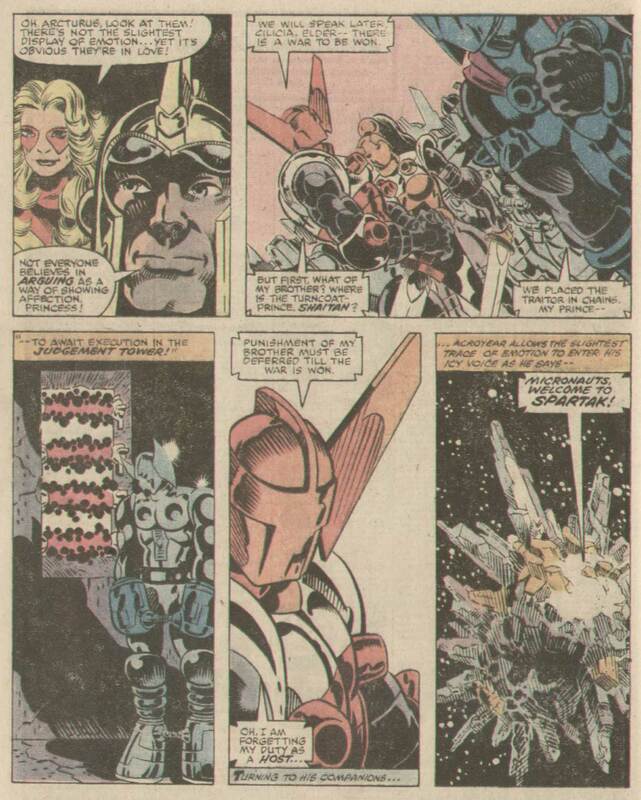 Anyway, I have been covering the action-packed, epic opening storyline to the forgotten classic comic book series, The Micronauts. 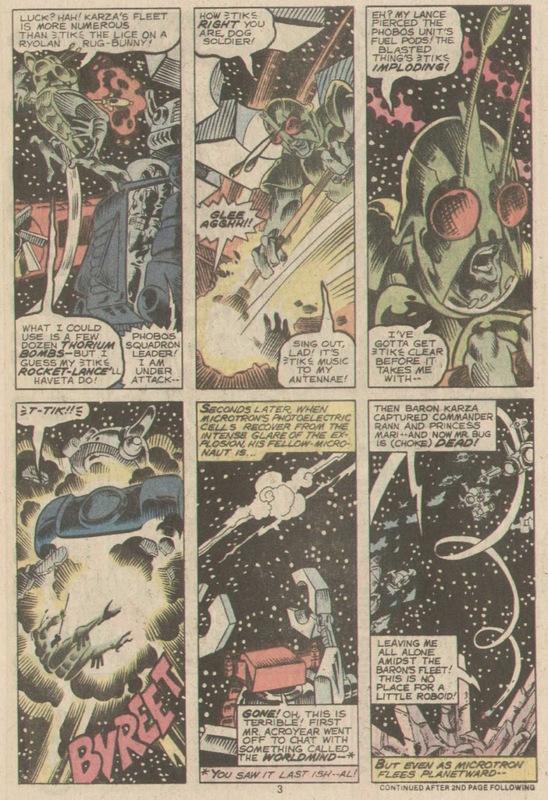 As we learned in part one, the heroic Micronauts battle to free the Microverse from the evil Baron Karza. 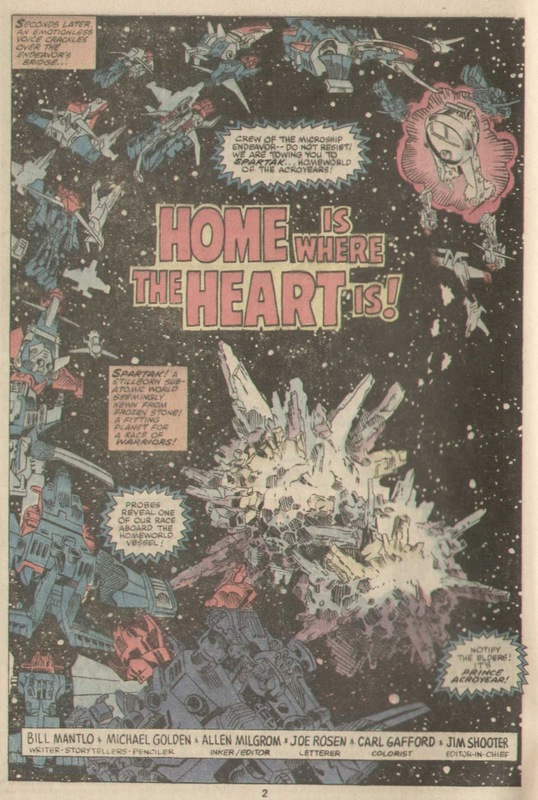 Bill Mantlo is on writing duties, while Michael Golden and Josef Rubinstein provide masterful artwork. 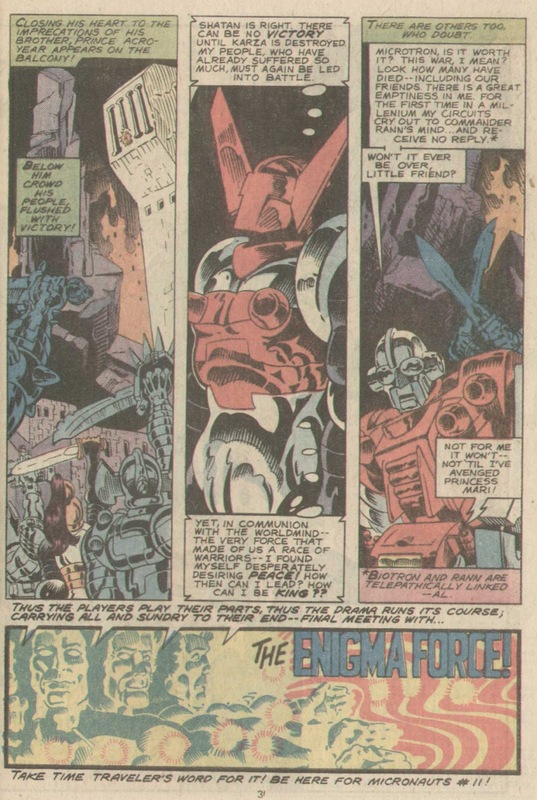 Last time, our heroes found themselves trapped on Earth, where they are no bigger than action figure toys. Young human Steve Coffin has befriended the team, but may have already lost his father to their struggle. Baron Karza strengthens his strangle-hold on Homeworld through his malevolent Body Banks. 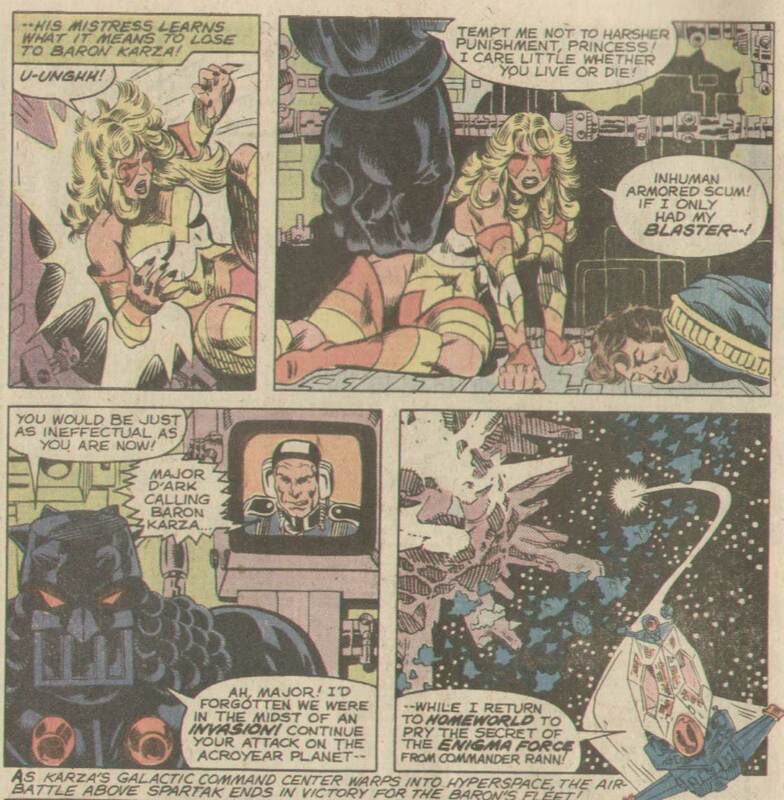 Renegade leader Slug has been captured, and her body targeted to be harvested. 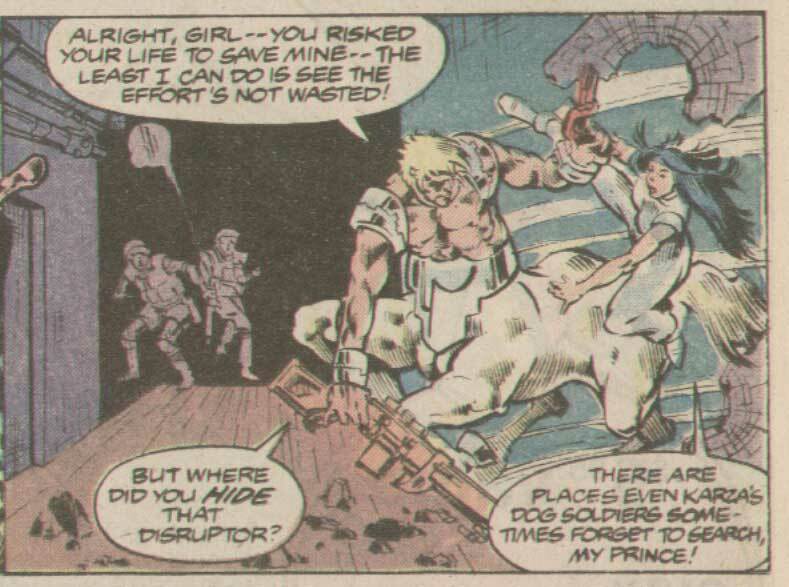 The noble Prince Argon has been twisted into a half-horse creature, and is also a captive of Karza. What will happen next? I can't wait to find out! #6. 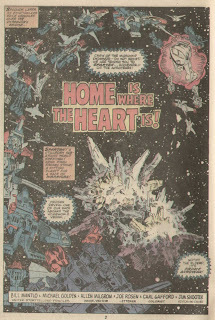 A distraught Steve Coffin and the Micronauts flee from Prometheus' roboid guards. They eventually make their escape from the facility and back to the truck. 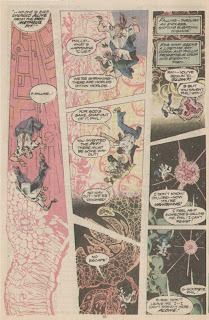 Ray Coffin and Prometheus fall through the pit, shrinking down as they enter into the Microverse. 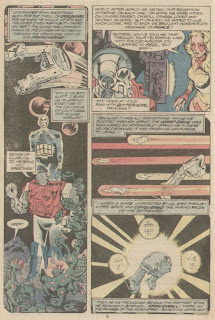 Ray Coffin is pulled away, where he comes face-to-face with the Time Traveller. 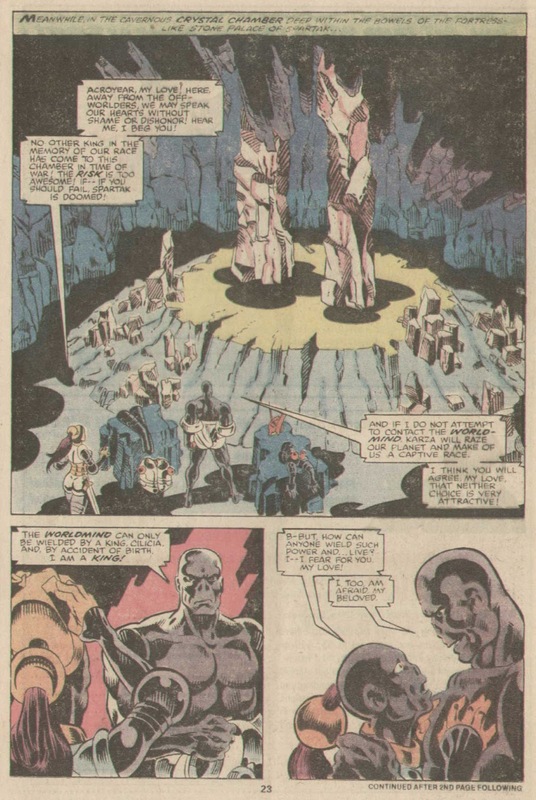 Baron Karza is summoned to meet with the High Shadow Priest, who informs him of Prometheus location. 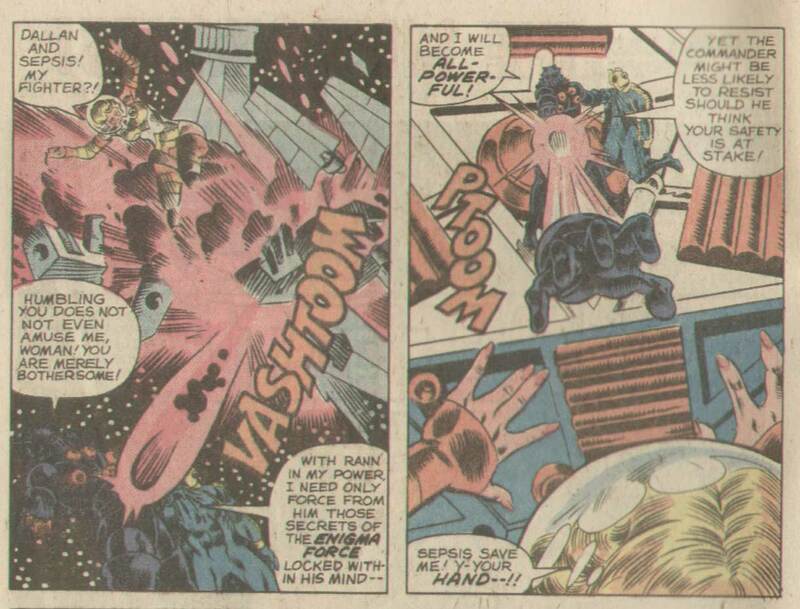 As Karza sends his fleet to intercept the invader, Slug breaks into the cell of a despondent Prince Argon. 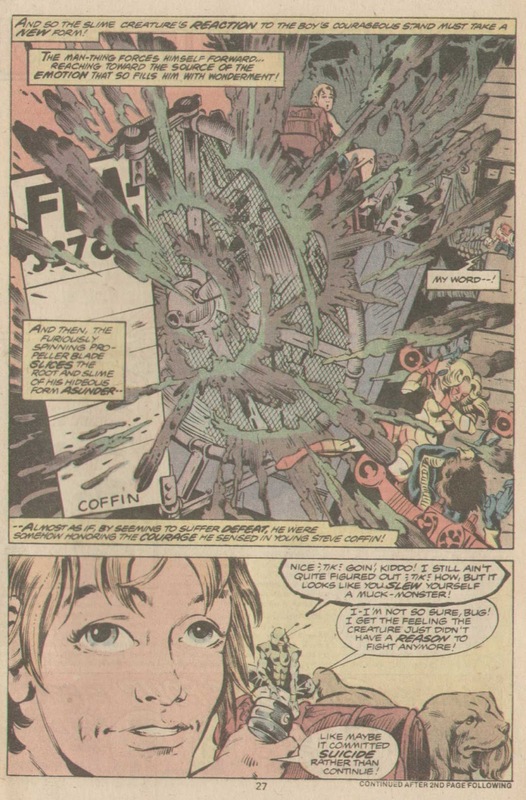 They make their breakout using the disruptor she was able to hide in her..…wait, what? Steve and the Micronauts arrive back at his garage, where Biotron has finished the repairs and run off his cat attacker. They decide to head to Steve's dad's fishing cabin in the Everglades to lay low for a bit. 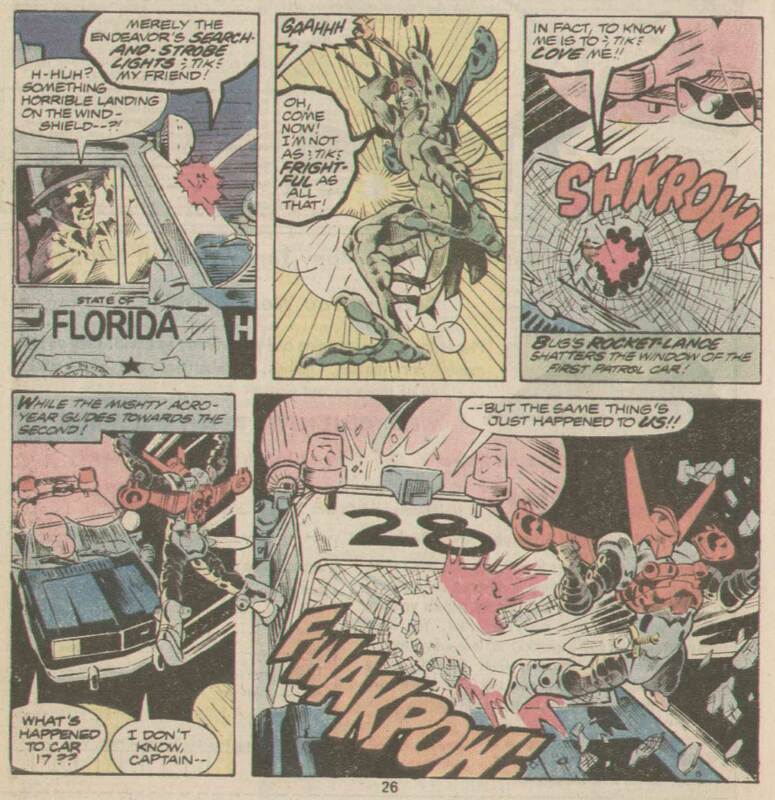 As they make their way to the cabin, Steve's truck attracts some police attention, which the Micronauts take care of. 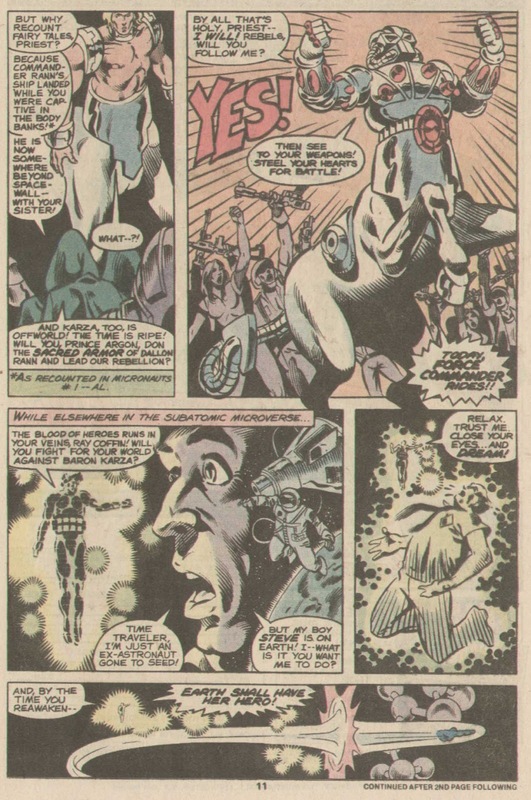 The issue ends with this unfortunate meeting that can signal nothing good for our heroes. My brain thoughts: A bit of a transition issue here, getting our characters from one spot to the next in preparation for future events. I'm not the only one that caught that little bit with Slug and her hidden weapon am I? I love how this series always has a bonus pinup or diagram in every issue. 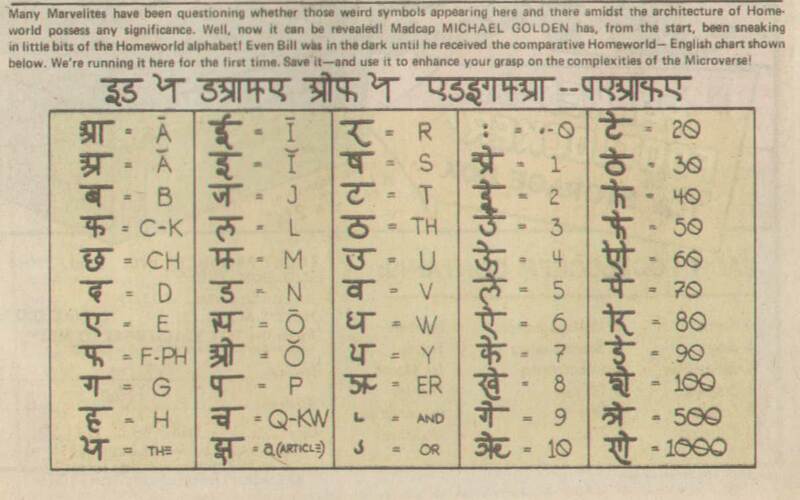 This one offers up the Homeworld alphabet courtesy of Michael Golden. 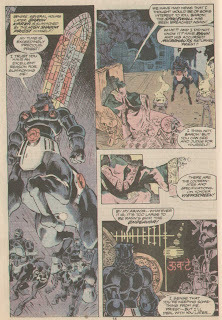 #7. Steve fishes his sorrows away, while Microtron monitors for television broadcasts. 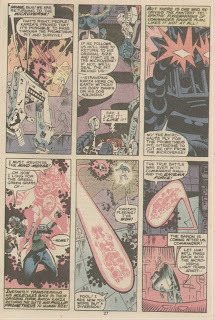 …including their experience on the fringe of the Microverse, where they first encountered the Enigma Force. 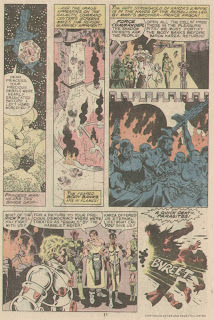 Baron Karza continues his observation of Prometheus, and comes to a troubling revelation, while Prince Argon and Slug arrive back with their resistance forces. 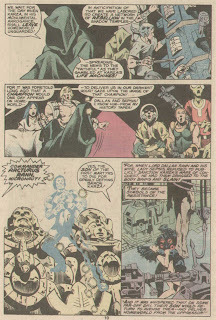 Back on Earth, Steve's sorrow attracts the attention of the Man-Thing. The team works to fight off the creature, until Man-Thing eventually meets his end (momentarily) in the blades of a swamp buggy. 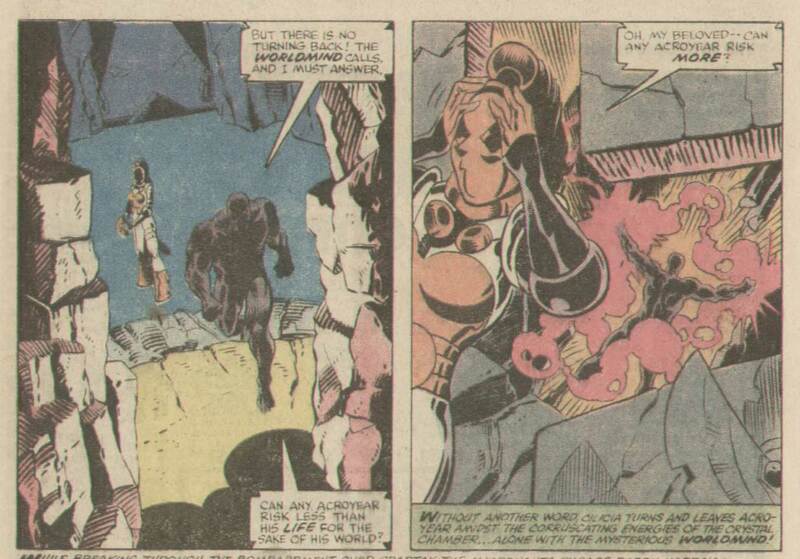 The issue ends with an ominous image, as a human-sized Baron Karza comes crawling out of the Prometheus Pit. My brain thoughts: A bit of an interlude issue here as they continue to move more pieces into place. 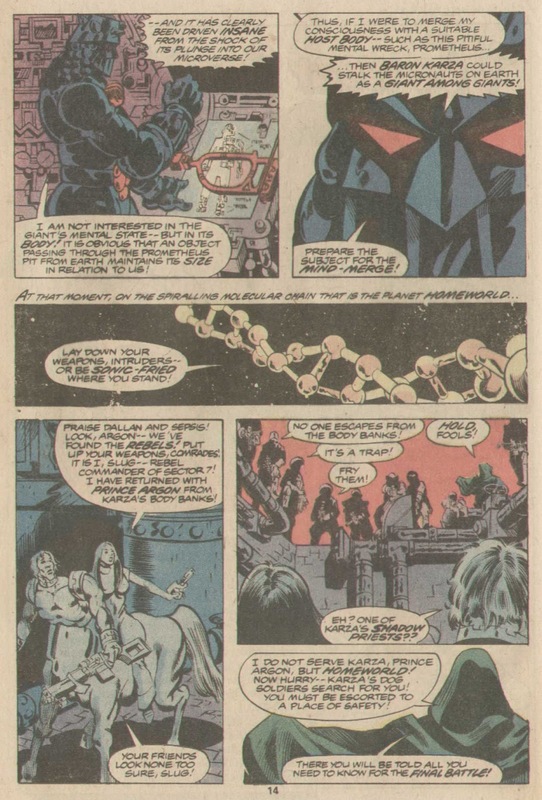 Karza successfully uses Prometheus to uncover the method he believes will help him to conquer the Earth. #8. 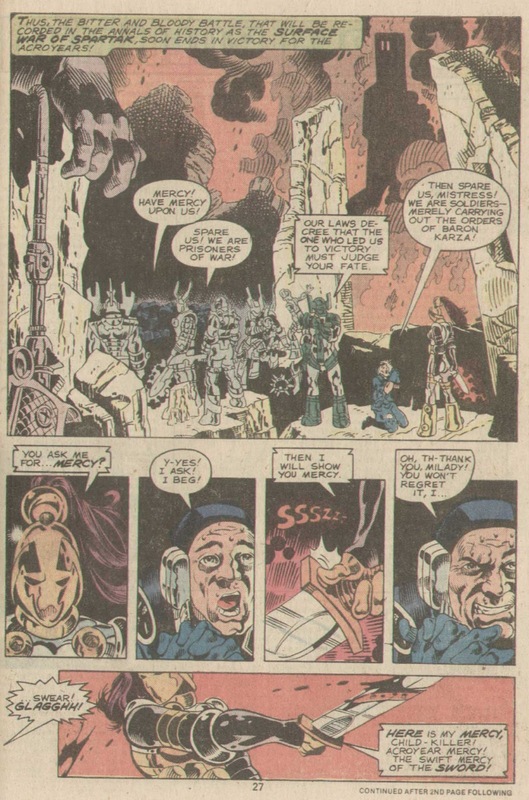 Baron Karza has arrived on Earth, and is blitzing the Army unit called out to respond. 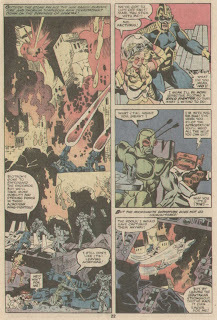 The Micronauts and Steve arrive on the scene to attempt to fight him off. 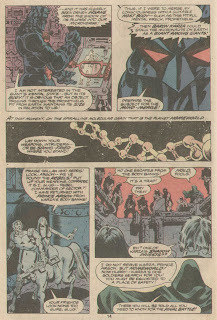 A Shadow Priest reveals to Argon, Slug, and the resistance that they have been working against Karza all along, and that Commander Rann is destined to become the champion that will save them all. 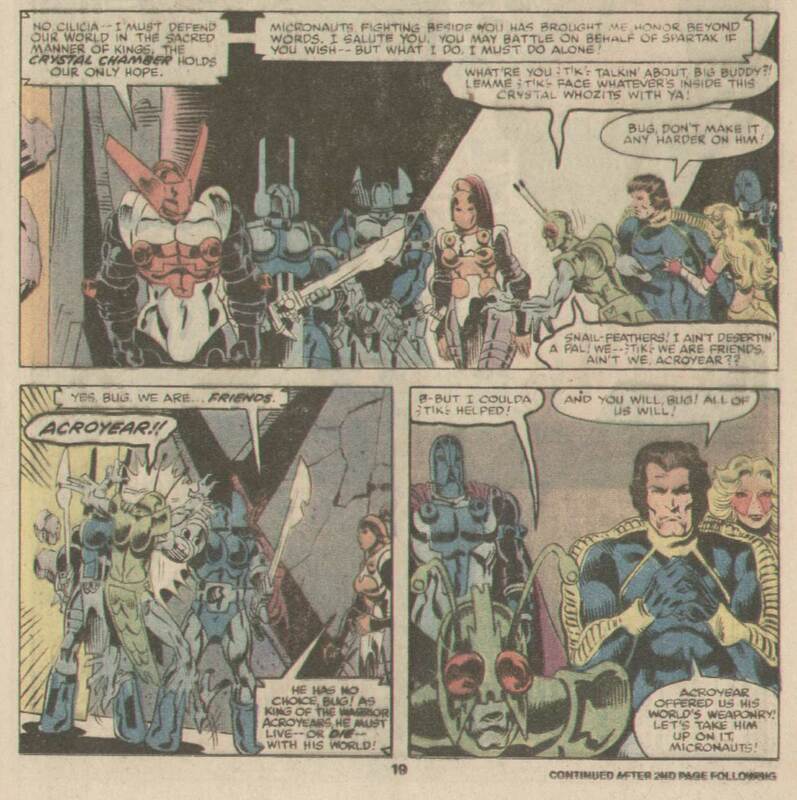 Reinvigorated, Argon becomes Force Commander and prepares to lead their rebellion into battle. Ray Coffin undergoes a transformation himself, courtesy of Time Traveller. 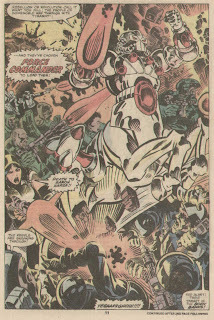 Baron Karza continues to overpower the smaller and less powerful Micronauts in battle. As Rann and Marionette both take a blast from Karza, Marionette reveals to Rann that she loves him. 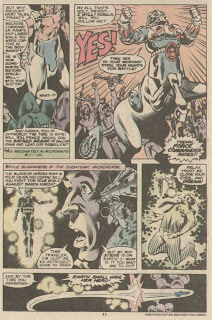 Just when it seems that they are beaten, Captain Universe arrives to save them all. 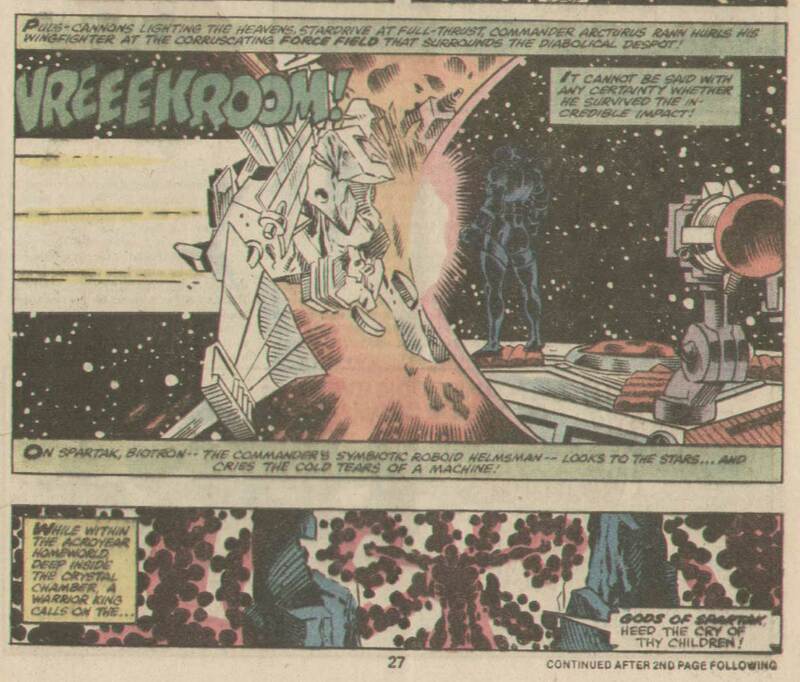 Captain Universe battles Karza to a standstill, giving the Micronauts time to regroup and make their escape. Heading for the Prometheus Pit, the Micronauts plan to either draw Karza back with them, or leave him behind cut off from his power source. 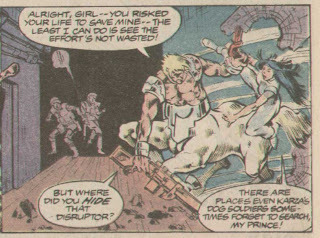 Karza separates from Prometheus and follows them back through the pit. 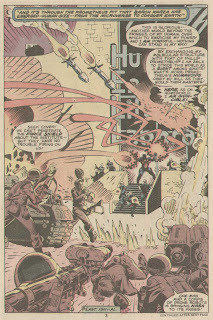 After they pass through, the mysterious members of the Enigma Force seal the pit. 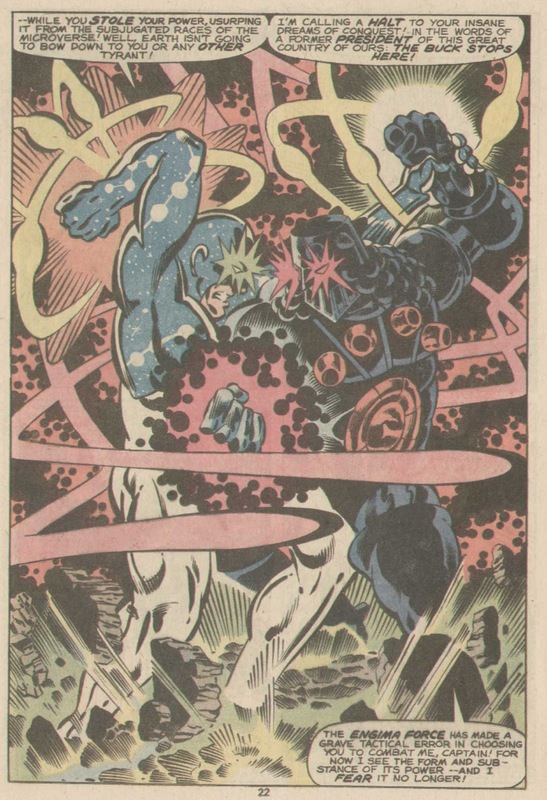 With the current threat ended, Captain Universe separates from Ray Coffin. 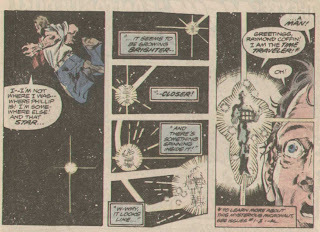 Ray and Steve reunite, with Ray promising to spend more time with his son. 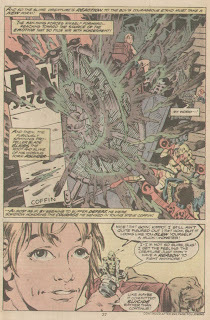 My brain thoughts: Bob McLeod takes over as inker for this issue, and it definitely results in a different look for the issue. Captain Universe makes its debut into the larger Marvel Universe here, an entity that is still in use to this day. 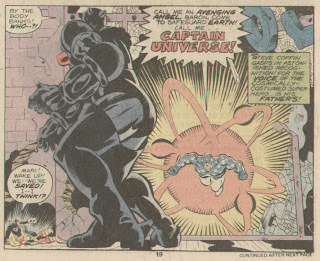 (Captain Universe provided one of the more memorable Spider-Man stories of my youth during the Acts of Vengeance crossover). 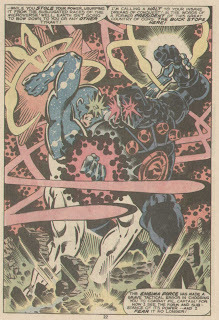 Baron Karza is quite the formidable foe to take on Captain Universe single-handedly. 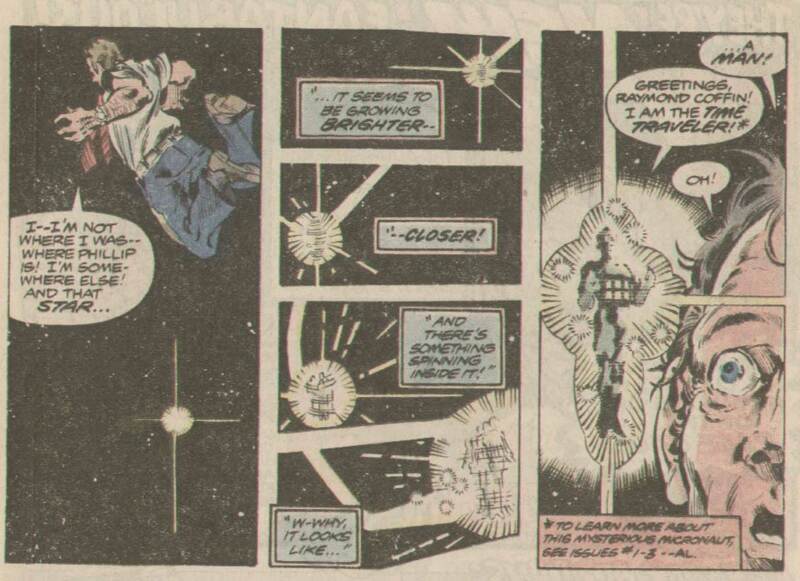 The story progresses forward at a nice pace here, as the Earth-based chapter of the story closes. 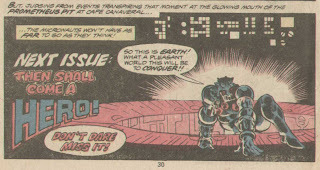 Now the final confrontation for the fate of the Microverse is approaching. 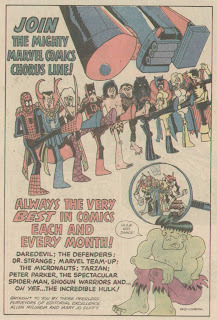 I don't remember ever noticing this before, but I love this Fred Hembeck drawn ad. #9. Having passed through the Prometheus Pit back into the Microverse, the Micronauts find them smack dab in the middle of an Acroyear armada near their home planet of Spartak. 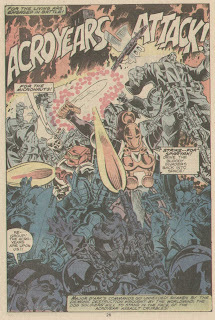 They land on the surface of the planet, coming face-to-face with an army of Acroyear warriors. 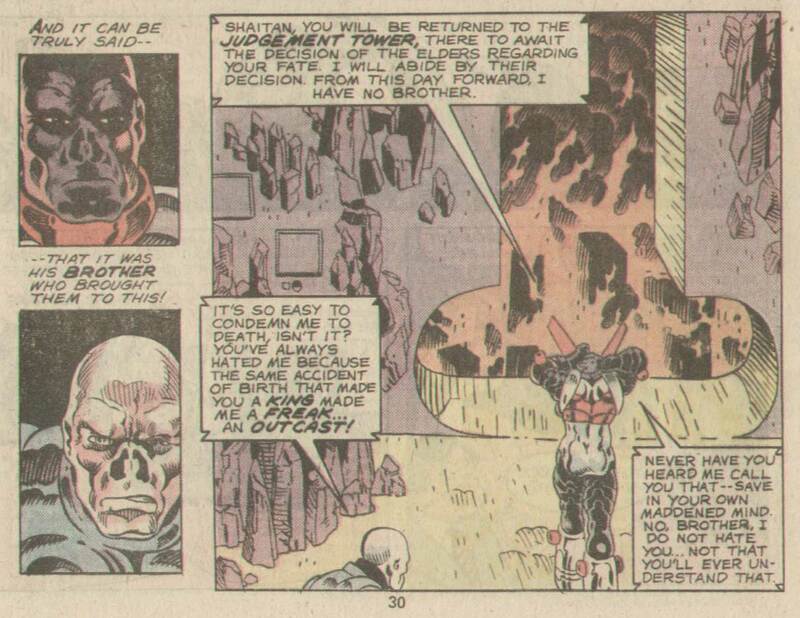 Baron Karza also returns to his body, his mind-merge with Prometheus having been severed. 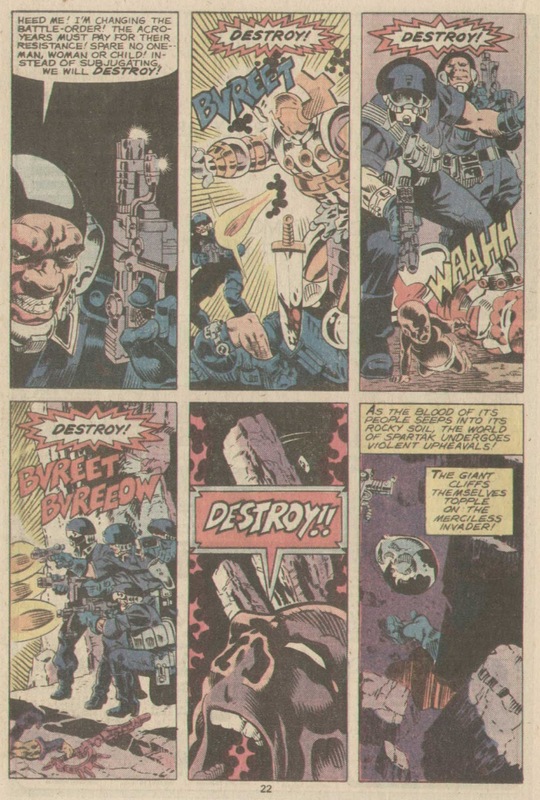 Tracing the heroes to Spartak, Karza prepares to lead an all-out assault on the heroes once and for all. Prince Acroyear and his comrades are surprised to be welcomed by his people. Their thoughtwash ended, they once again pledge loyalty to their rightful King. A female by the name of Cilicia appears to be the happiest (as far as Acroyears go) to see his return. 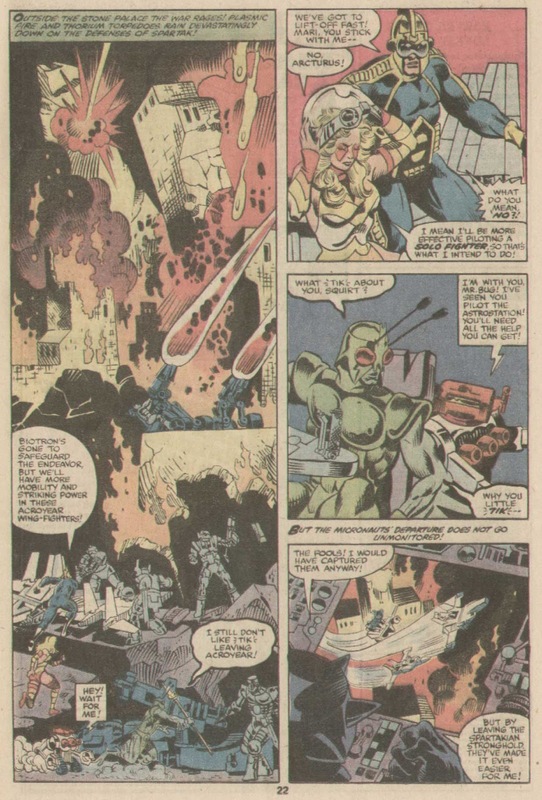 Meanwhile, back on Homeworld, Slug and Force Commander lead their assault on Karza's forces. Together with the power of the Shadow Priests, they make great progress in decimating the enemy. Back on Spartak, Baron Karza and his fleet arrive and begin their attack. 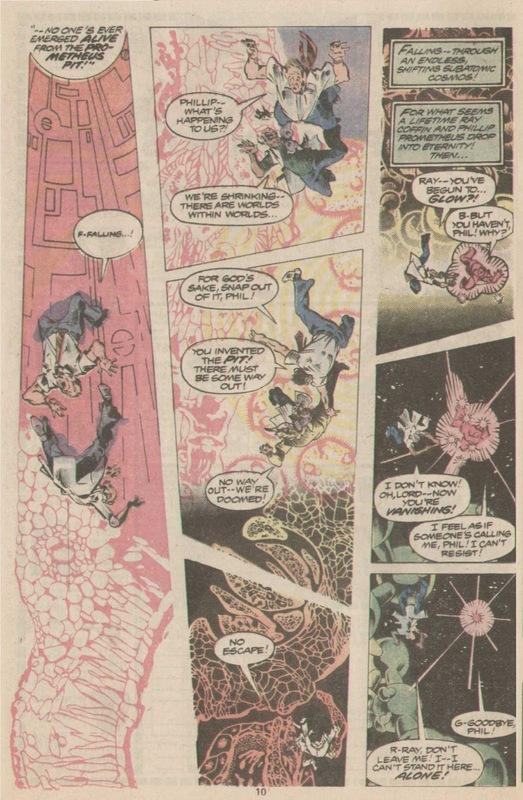 Outnumbered and overwhelmed, Acroyear moves to consult with the sacred Crystal Chamber, leading to this touching exchange between him and his pal Bug. The heroes take great damage as Karza's evil forces blast them from afar. 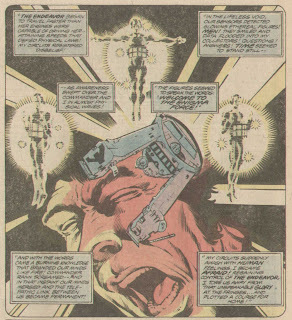 Acroyear prepares to contact the planet of Spartak itself, called the Worldmind. We also get our first look at Acroyear's face under the helmet. 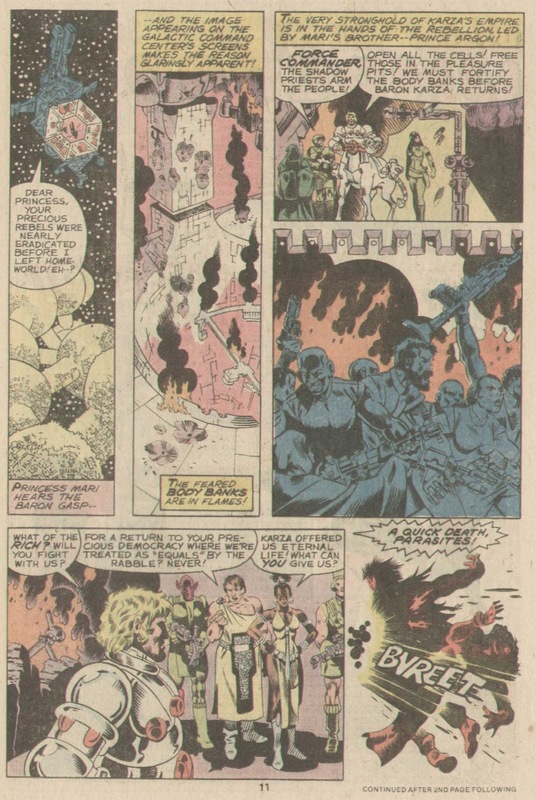 As he prepares to link his mind with the planet's, Cilicia prepares for battle. Commander Rann makes a play for Baron Karza himself, with less than stellar results. With our heroes on the edge of defeat, Acroyear achieves Worldmind! 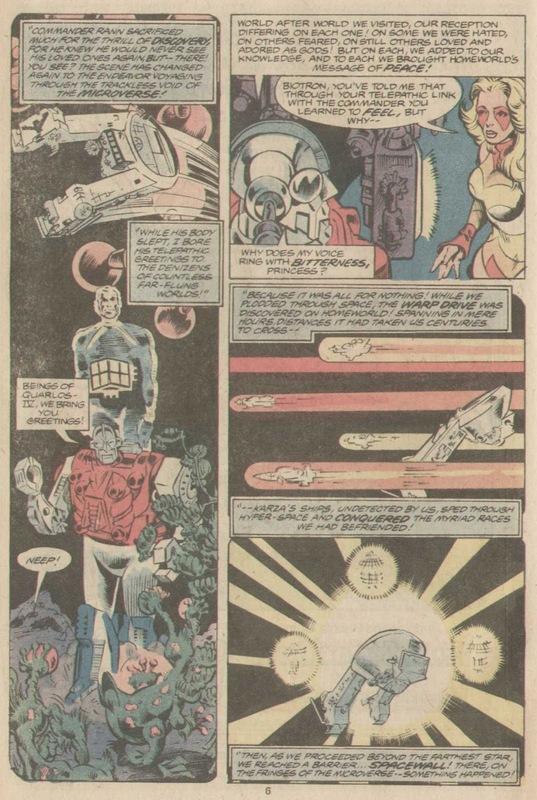 My brain thoughts: A two-pronged battle against the forces of evil begins, with the rebellion laying waste to Karza's forces on Homeworld, while the Micronauts battle Karza himself in space. Eat your heart out Return of the Jedi! 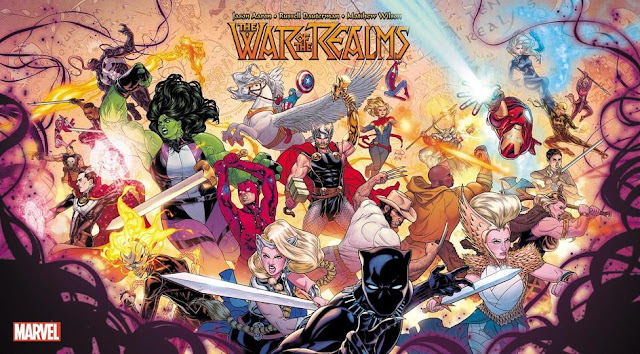 See, the older reader like myself figures that this is probably the low point for the heroes before the eventual triumph, but that doesn't make this any less exciting. 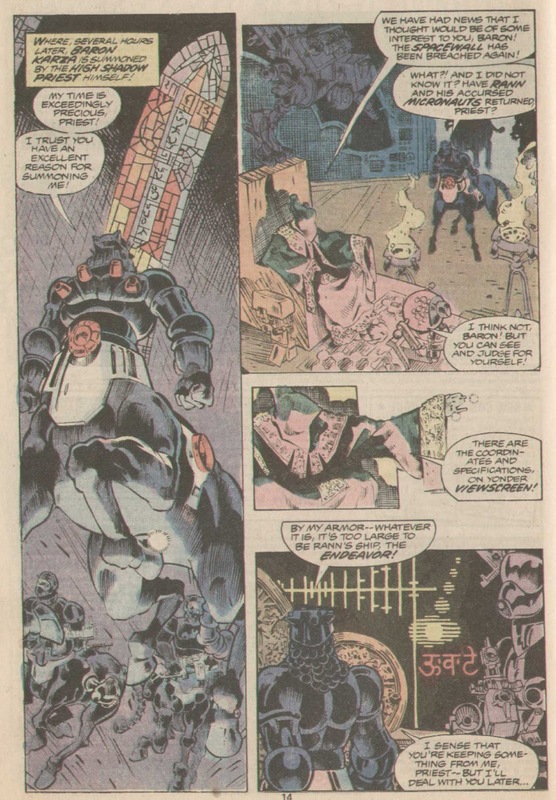 Al Milgrom takes over as inker for this issue, and while the results aren't as impressive as when Rubenstein was working on the book, they still produce some quality pages. #10. 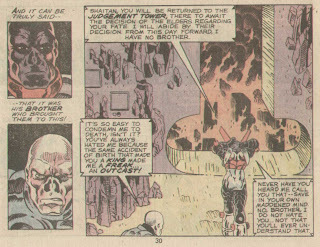 Marionette attempts to free the captive Commander Rann from the clutches of Baron Karza, with less than impressive results. 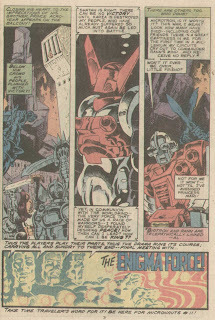 With Rann and Mari captured, Bug appears to meet his end in battle. His ultimate goal achieved, Baron Karza makes his return to Homeworld. 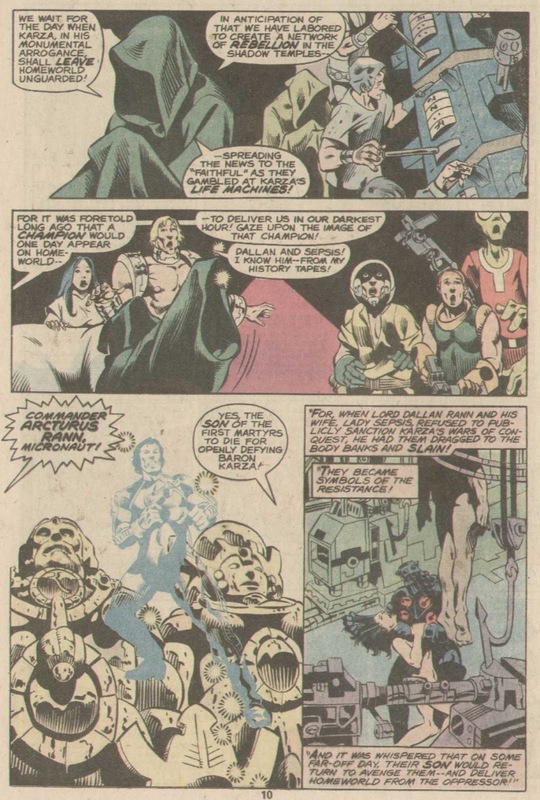 Shaitan taunts Cilicia as their hopes continue to get dimmer, leading to the reveal of Shaitan's real face, and the source of his angst. 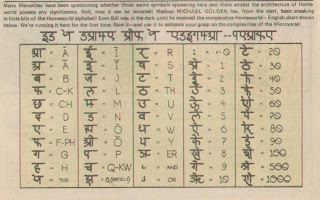 The Worldmind begins to make its presence known. 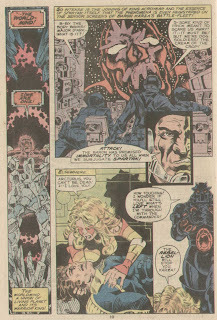 On Homeworld, Force Commander and his rebellion make the final touches on their victory over Karza's forces. As the rich elite remain defiant to the end, Slug gives them the reward they deserve. 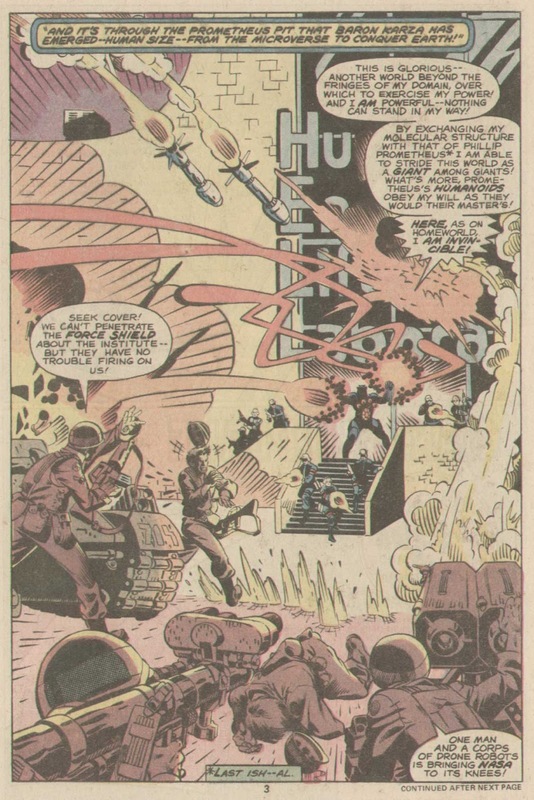 The Worldmind begins to hurl large pieces of rock at the enemy fleet, and increasing its gravity to bring them down to the surface. Now planetbound, Karza's forces move to kill everything in their path. The bloody battle over, the enemy soldiers plead for mercy, and instead receive Cilicia's blade. Acroyear emerges from the Crystal Chamber, to find Shaitan outside. 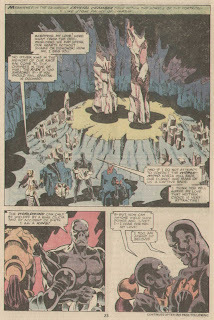 The battle won, but not the war, the remaining heroes prepare themselves for the final conflict. My brain thoughts: This series was ruthless, and I love it. Karza's forces and his supporters receive exactly what they deserve. 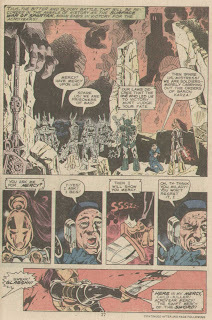 His army severely crippled, all that remains is to take out Karza himself, which will be no easy task, especially with Bug having fallen in battle, and Marionette and Rann taken prisoner. 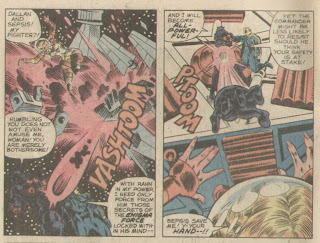 This is how epic action storytelling is done. My final brain thoughts: This is as good a place as any to end it for now. 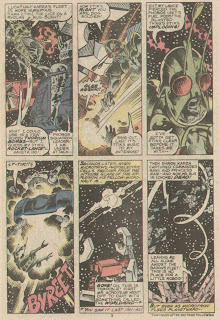 These issues saw the conclusion of the chapters on Earth (for now) and the beginning of the ultimate battle for the Microverse. 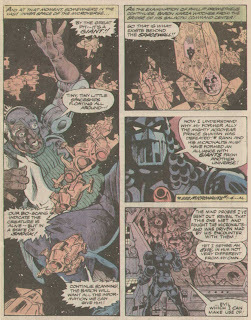 Baron Karza's forces appear to be on the edge of defeat, but no victory can be won until Karza himself is taken down. 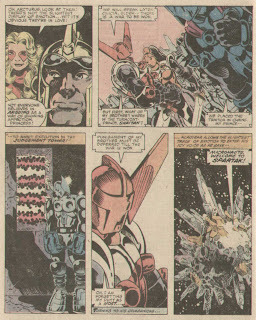 Burgeoning romances continue between Marionette and Rann, as well as Slug and Argon. Acroyear is back in his rightful place as the ruler of his people. 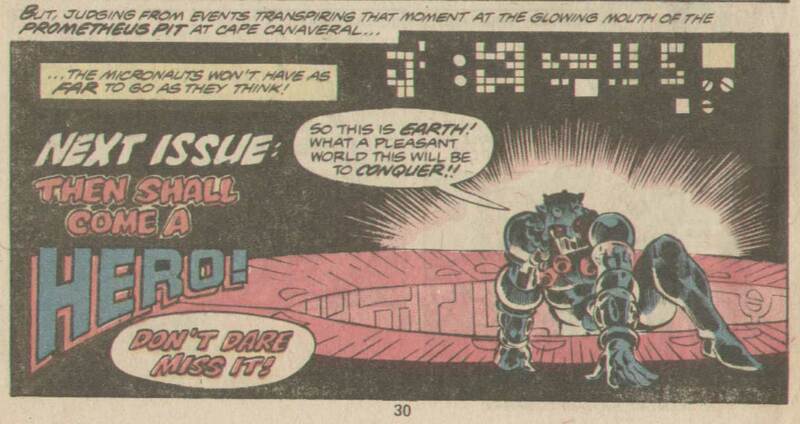 Bug appears to be the first casualty of the war for the Micronauts. The robots continue to be uninteresting. What will happen next?! 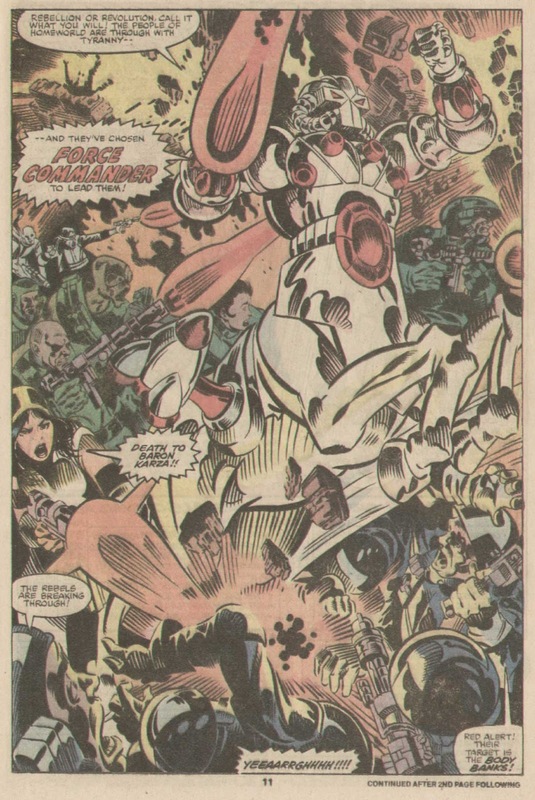 Find out with me in the next and final installment of my Micronauts retrospective!